As fantastic as this all may be, I’ve found that if I want to send someone a text (especially a long one) while I’m working on my computer, it’s much easier to use Outlook rather than pull out my phone. Granted, I’m not a black belt texting ninja but, I can type 100+ words a minute. So why not take advantage of the big boy keyboard :) not to mention I can send an email (thus the text message) quickly to more than one person AND, (best of all) it’s Free (for me, the sender that is). Now I know what your thinking. If I’m sitting at a computer, why not just use email?? Put simply; email gets buried. Plus, not everyone has access to email from their phone. That’s the whole point of Text Messaging. 1. Open up your e-mail program and Compose a new email/text message. My friend John Doe’s phone number is 949-644-8090, and he’s a Verizon Wireless customer. To send him a TXT message using my GMAIL account I would just Compose a new email, and send it to 9496448090@vtext.com. Note: When you write your email, don’t forget that most carriers only allow 160 characters or less for Text Messages. A character is a letter, number, space, or line break. GROOVY eh? 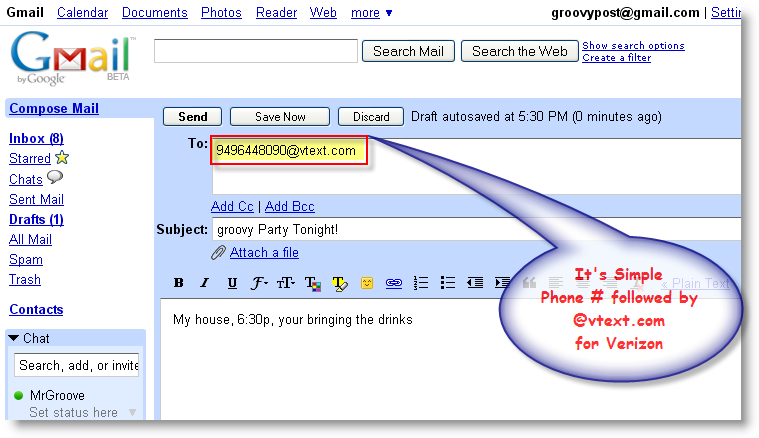 Have a groovy time sending texts to everyone you know from your e-mail client! I do this all the time, it’s pretty “groovy,” Anyhow I don’t think you mentioned it but you can also send people e-mails from your phone in the form of text. I know this works with g-mail, not sure about other carriers. 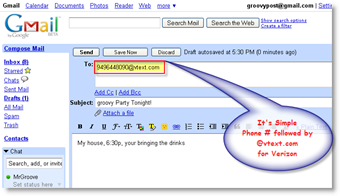 Just address the text message from your phone like you would an e-mail address. Like for instance I have a friend named John, his email is johnny81@gmail.com. I can text message him e-mails all the time just by addressing johnny81@gmail.com as my txt recipient instead of a phone number. Aha I just figured out the best use for this ever! My phone was missing and I couldnt find it, and I do not have another phone here at the house to locate it with. So I texted my cell phone from my e-mail account and…beep beep beep. FOUND!!!! hey can i send sms to nepal telecom using the above method? You can also use this to send texts to people’s emails. just replace the phone number recipient with an email recipient, most phones can do this. HOW TO SEND MESSAGES FOR VODAFONE..? I don’t know how to send one to someone that has cricket wireless. would you have any idea at all? I’m from Malaysia. I want to send message to this number 60134443492@mmsc2.celcom.net.my but its can’t. How do I do it? I have friends in the Philippines and they use globe telecom I seen in a earlier g&a that you could send text from a pc to mobile. Anybody here knows the what I would place after the number there for globe 639083092080@_ G_ L_ _O _ B_ _ E_ _ _ _ _ _? yahoo worked till I reached text # 3 then i could not send till they responded to a previous text from my messenger grrrrrrrrrrrrr. Do you know what I would use for a Cellular South customer? This way the entire Groovy Community can assist you!